Iowa covers 56,276 square miles and has a population of 2,926,324 people. 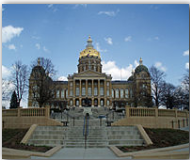 Iowa’s capital is Des Moines, which has a population of 198,682. Other important cities are Ames (pop. 50,731), Cedar Rapids (pop. 120,758), Council Bluffs (pop. 58,268), Davenport (pop. 98,359), Dubuque (pop. 57,686), Iowa City (pop. 62,220), Sioux City (pop. 85,013), Waterloo (pop. 68,747) and West Des Moines (pop. 46,403). Iowa was admitted to the Union on December 28th, 1846 as the 29th state. It’s bordered by Minnesota to the north, Wisconsin to the northeast,Illinois to the southeast, Missouri to the south, Nebraska to the west and South Dakota to the northwest. The state flower is the “Wild Prairie Rose” and it’s nickname is “Hawkeye State”. Iowa’s economy is broken into two categories; Hogs, corn, soybeans, oats, cattle and dairy products provide for the agricultural side. While food processing, machinery, electric equipment, chemical products, printing and publishing and primary metals provide for the industrial side.